From the Reading Tools menu on your Galaxy Tab S2 NOOK, you can move quickly through a book, search for something specific, share your knowledge, or change the way the page looks. 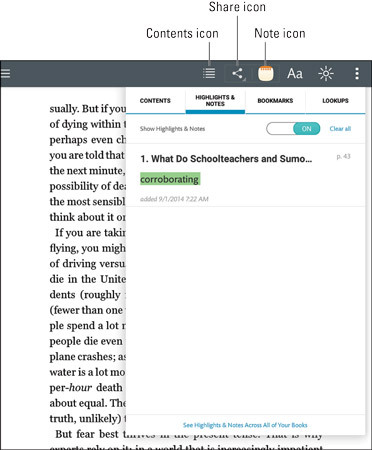 To see the secondary reading tools, press and hold on a word or anywhere on the page. It might take a few tries to get the hang of it: Tapping brings up the full set of tools, including the slider bar. A more determined press-and-hold brings up the secondary reading tools. Press and hold to reveal reading tools. To select a word, press and hold on a word; then lift your finger. The word is highlighted in blue, and you’ll see a darker blue vertical bar on either side of it (unless you’ve chosen a different color theme for the page). To expand the highlight, tap and then drag one of the vertical bars; this tool is called the Text Selection tool. When you lift your finger or fingers (you can use your thumb and pointing finger to cover more area), the Text Selection toolbar appears. Samsung offers free apps to work with a number of printers that can accept material beamed to them by Wi-Fi Direct. But all users can use this trick to print a passage from your Tab S2 NOOK: Select a passage and send it to yourself by email. Then use a computer and printer to make a hard copy. Be sure you understand the proper use of citations if you’re using part of a copyrighted book in an academic paper or a publication of your own. You can insert a comment (up to 512 characters) about the highlighted word or phrase; the date and time are included. A small icon that looks like a sticky note with a + mark will appear onscreen. You can search for what’s in your note. You can view and change notes any time. You can make notes invisible. Why? Perhaps you want to share a selection or loan a book but keep your comments private. Tap anywhere on the page. The slider bar and system bar appear at the bottom of the page. The icon looks like a stack of four dotted bars. Tap the Highlights and Notes tab if it isn’t already selected. Tap one of the notes. You’re taken to the page where it’s attached. 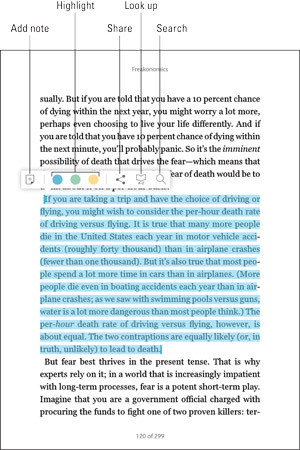 Tap the highlighted word on the page. View Note. Tap to read the comments you placed there. Edit Note. Tap to see the comments onscreen. Use the keyboard to make changes. When you’re done, tap Save. Remove Note. Tap to delete the note; there’s no second chance, so be sure this is what you want to do. Remove Highlight. Tap to take away the color highlighting. The color shading disappears immediately, but you can always press the word and reinstall a bit of a hue. Change Color. Tap one of three colors (aqua, lime green, or sunset yellow) to make a change. From the table of contents in a book you can add highlights and notes and bookmarks, and also see the record of any Lookups on the Internet you have made based on the book you are reading. You can share a word or pick up a short passage and send it by email (or Twitter or in a Facebook post). The NOOK is ready, willing, and able to assist. When you tap Share, you can connect to any of the communication services to which you subscribe or are installed on your device. These include Wi-Fi Direct, Quick Connect, and Bluetooth, as well as services like Email, OneDrive, Drive, Gmail, Hangouts, and Memo. If you’ve added apps like TypeMail or Skype or enabled Microsoft’s OneNote, they appear in the list as well. You can copy quotes to the Clipboard, a standard option of Share. Once the material is in Clipboard, you can paste it into an email, a Word or Memo document, or just about any other app.